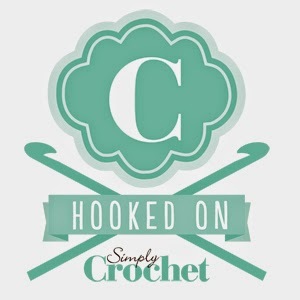 Today I’m off to teach a crochet flower class at the Ditzy Rose Makery in Tattenhall, Cheshire. I’m sharing the pattern we’re going to use here, so even if you can’t be there in person you can join in the crochet flower fun! This pattern first appeared in Inside Crochet magazine (issue 89), this simple motif has so many uses, stitch them to brooch backs or hair clips. Sew lots together to make bangles or embellish a favourite sweater. 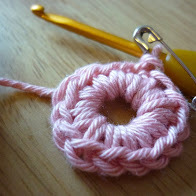 For small flowers use 4 ply yarn and 3mm hook. 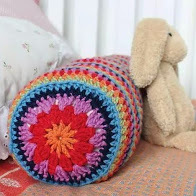 For larger flowers choose thicker yarn and a larger hook). Make 6ch, join with a sl st to make a ring. Rnd 1: 10dc into ring, sl st into first dc. Rnd 2: 5tr into next dc, (sl st in next dc, 5tr in next dc) four times, finish with a sl st in same place as sl st on rnd 1. Rnd 1: *1dc in second ch from hk, 1 htr, 1 tr, 2tr in next ch, 1tr, 1htr, 1dc in last ch **, 1ch. Do not turn, work into the underside of foundation ch from * to **, sl st into next st. Fasten off yarn. Weave in ends. If desired, small running stitches can be added to each leaf to imitate veins (see photos as a guide). Sew buttons or beads to the centre of your flowers and arrange on your chosen brooch back or hairclip (use photos for inspiration). Stitch in place using a needle and cotton thread.